The Russell Hoban Some-Poasyum (aka Hoban 2005) was the world's first and so far only international Russell Hoban fan convention. Taking place in the UK on the weekend of 11-13 February 2005, a few days after Hoban turned 80, the faithful gathered for a tour of "Hoban's London", a reading and Q&A session by the author himself and a visit to Canterbury Cathedral (inspiration for the classic novel Riddley Walker). Accompanying the event was "80! 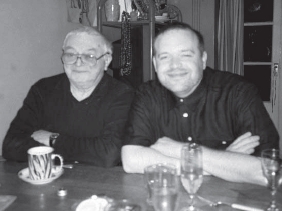 ", a 50-page booklet featuring contributions from many of Russell Hoban's friends and associates, as well as fans. To celebrate 10 years since the convention, the booklet is today being published online for the first time. 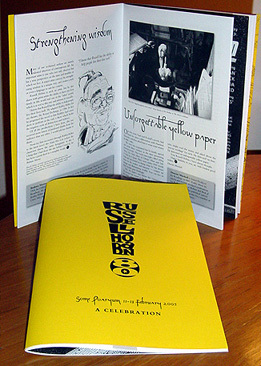 The Some-Poasyum was a unique event, fondly remembered by all who attended, and the Celebratory Booklet was a memento that truly did justice to the occasion. A beautiful piece of very hard work by editor Chris Bell and designer Elisa Bowman, it brought together some wonderful tributes from the great and the good, including a new drawing by Sir Quentin Blake, a handwritten letter from Glenda Jackson and an amazing essay by novelist David Mitchell on the importance of Riddley Walker to his life and to his bestselling novel Cloud Atlas. As the webmaster of russellhoban.org and principal organiser of the convention I've done my best to, in turn, do the booklet justice, converting the articles to web pages which you can either read in a vertical scroll or by clicking on individual articles of interest. However you read it, I hope you enjoy it and agree with me that bringing these articles and images online after 10 years adds something very special to this site and the ever-growing archive of content related to a much-loved and vastly under-appreciated writer. Wishing you all a strong and healthy 2005! Although I have always been impressed by the general wisdom of Neaera’s remark, I’m pleased to be able to disagree with it in at least one particular case: finding and getting to know my fellow Hoban fans has turned out to be a pure delight. In fact, it has been something more and better than a comfort for us to share our like-mindedness through the miracle of the Web and email: it has been downright energising. Elsewhere in this booklet is a piece where I relate the history of how the amorphous mystical collective entity we call The Kraken came into being, and grew into the many-tentacled worldwide force behind this first ever Russell Hoban convention. At the moment, I’ll merely note that I’ve moderated quite a number of online communities in the years since the internet took over my life, but none of them have thrived or created such a convivial, addictively sociable atmosphere as The Kraken. It’s as if each member instinctively understands that to find a group of highly literate oddballs to whom one can talk about “the flicker of being” and the “limited-reality consensus” — and get in return a supportive nod of the head, instead of directions to the nearest mental health facility — is a rare and precious thing to be treated with the utmost respect and appreciation. Now we get to take the experiment a step further, and spend a weekend rubbing shoulders and clinking glasses instead of pecking keys and clicking mice, or meeces, or whatever is the proper plural of those things we’ve been clicking all these years. Some of us have met each other on an individual basis, and sometimes a cluster of three or four of us have gotten together. But this convention is the first time a conclave of Hobanistas numbering in the dozens will come together in the physical world for a weekend of bonhomie, camaraderie, and all sorts of other subversive French nouns, and in the process attempt to enlarge the limited-reality consensus ever so slightly by sheer force of group will. I suspect, like Neaera H. and William G., we’ll find the crossing of our paths to be rewarding, energising, full of surprises — and who knows? Maybe even a bit of a comfort. In that spirit, and in celebration of the 80th birthday of “the man himself”, it is my distinct pleasure to welcome you all to the first Russell Hoban Some Poasyum, in his adopted home city of London, where he has documented so many fortuitous first meetings.